As our lives are becoming more and more connected, we rely more than ever on having access to a fast Internet connection wherever we are. Yet, when it comes to home Wi-Fi, the experience can be frustrating, such as when you’re trying to watch your favorite show – just to be greeted with a buffer bar. This is especially true if you live in a large home where Wi-Fi dead spots are common, restricting you to work or enjoy entertainment in rooms with a strong signal. The first thing that often comes to mind to solve these problems is to buy a Wi-Fi range extender that allows you to bring Wi-Fi to areas of your home that have weak or no signal. And while extenders and repeaters help expand your Wi-Fi coverage, they also compromise performance and convenience. 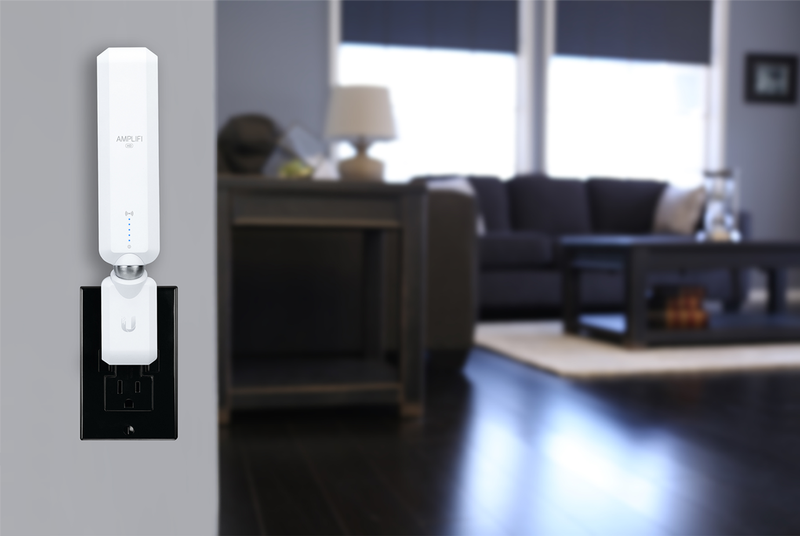 Recently introduced mesh Wi-Fi systems, such as AmpliFi™ HD, solve many of these issues while also offering superior performance, plug-and-play installation, a sleek design, and easy ways to manage your network. Starting at only $129.99, AmpliFi MeshPoint HD is the only mesh Wi-Fi system that doesn’t require you to replace your existing setup. You can start with a single MeshPoint HD, which can be added to any existing router to blanket a home with Wi-Fi. The system can be upgraded with additional MeshPoints or even the AmpliFi HD Router when necessary. Single-band extenders need to receive and retransmit data using the same radio on the same channel; this reduces your bandwidth by up to 50%! Why limit the speeds you are paying for with sub-par networking gear? AmpliFi MeshPoint HD’s dual-band system allows data to be simultaneously transmitted for the fastest speeds – the speeds you deserve. For an extender, imagine a single-band radio is a narrow street, which only allows one car to pass at a time. The cars represent data that is being either transmitted or received. This bottleneck limits throughput and can cause speed degradation of up to 50 percent. 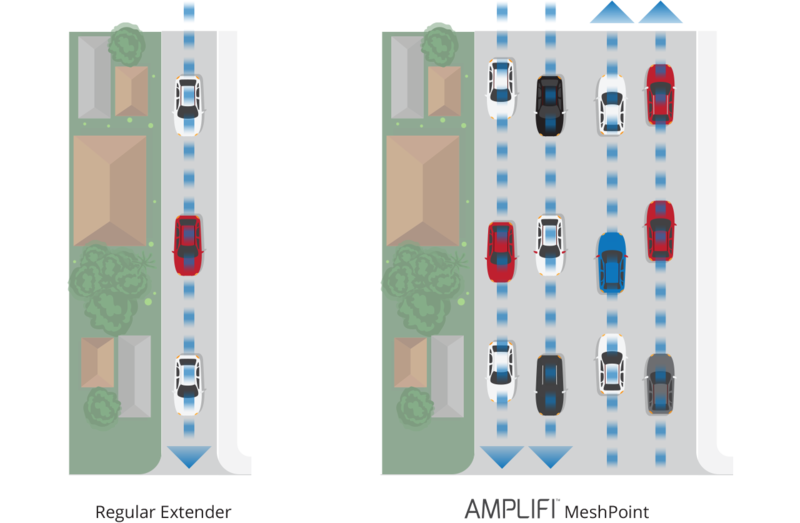 For AmpliFi MeshPoint HD with its dual-band radio, data traffic flows smoothly during transmission and reception like a wide, multi-lane highway. Extenders often require a different SSID (network name). Move too far away from your main router and you’ll be forced to physically toggle between the networks on your devices. AmpliFi MeshPoint HD allows you to freely move about your home without having to switch to another network name – which could occur if you were using an extender. With the AmpliFi MeshPoint HD, your devices automatically connect to the strongest signal with seamless handoff. Since extenders must be in range and have direct communication with your router, it is not possible to create a daisy-chain of extenders to provide coverage on the other side of your home. Extenders are limited by distance, as they have to be placed close enough to communicate directly with your router. The AmpliFi Wi-Fi System is designed to be completely scalable, so add as many as you need for flawless coverage. For the average person, most installations include fumbling around with the instruction manual just to pull up the correct configuration web page – not to mention, figuring out optimal placement of the extender through trial and error. AmpliFi MeshPoint HD is super simple to connect to ANY existing Wi-Fi router/network. If you can download an app, you can enjoy blazing speeds everywhere with no hassle at all. The LED indicator lights take away all the guesswork on MeshPoint placement, and the app walks you through everything. The MeshPoint HD also features a unique magnetic joint that allows you to rotate the antenna for optimal coverage.